OAKLAND, Calif. (AP) It took two months of scrambling and three big swings from the heart of their lineup to finally get the Tampa Bay Rays back above .500 after an awful 1-8 start. Now the challenge for Kevin Cash’s ballclub is to stay there. It’s the fourth time in franchise history that the Rays have hit three consecutive home runs and the first since Sept. 21, 2016. Jed Lowrie had two hits and an RBI for Oakland. The A’s have scored four runs or fewer in their last 13 home games. 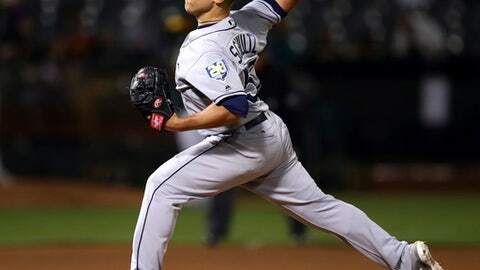 One day after six pitchers combined for Tampa Bay’s first shutout of the season, the Rays got another strong outing from their starter and bullpen. Carlos Gomez got a helping hand from A’s fan Matt Welch, who was sitting in the stands near Tampa Bay’s bullpen and let the Rays right fielder borrow a pair of sunglasses to battle a tough glare in the first inning. Gomez returned the favor a few moments later after chasing down Lowrie’s foul ball when he gave the fan his glasses back, along with the ball. Schultz’s celebration was short-lived. He was optioned down to Triple-A Durham after the game to make room for pitcher Nathan Eovaldi, who is starting on Wednesday. The Rays also transferred right-hander Jake Faria to the 60-day disabled list. Rays: Brad Miller was back in the leadoff spot of manager Kevin Cash’s lineup after hitting a ball that ricocheted off a protective screen and hit the first baseman near his left eye, opening a small cut during batting practice Monday. Athletics: Designated hitter Khris Davis (strained right groin) will come off the disabled list when he becomes eligible Thursday, Melvin confirmed. Melvin also said that RHP Paul Blackburn’s rehab stint will begin Thursday with Single-A Stockton.